A lady with a noble mission. A duke looking for redemption. 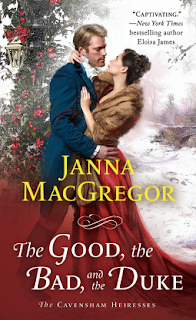 A forbidden love that cannot be denied, in The Good, The Bad, and The Duke by Janna MacGregor. I'm a new fan of Janna MacGregor and I was so excited to read another Cavensham Heiress story. Daphne Hallworth lost her sister, but she put the feelings of her family before her own. She strived to become the perfect daughter and sister but was never allowed to properly grieve. When she loses the diary that holds all her feelings about her sister's tragic death and her repressed feelings for her brother's ex-friend, she must rely on him to get it back and save her family's reputation. There's a history between Daphne's family and Paul, but he only wants to make amends and restore the honor of his name. Both situations seem impossible, depending on whose perspective you are looking from, but the journey there is exciting to read. I've always really enjoyed stories where the heroine falls for the hero in their youth. The Good, the Bad, and the Duke is particularly sweet. Daphne may have fallen for Paul as a child, but she never let her feelings for him take control of her life or cause her to lose her head. Paul's sense of honor leads him to help a damsel in distress even though helping her may not bring back the friendships he lost. This is one of those stories that comes full circle to resolve itself and I loved that sense of the characters making things right in their lives, and the lives of others. Every Cavensham Heiress novel has a unique flair that tingles the senses and always satisfies the romance monster. I can't wait for the next one, Rogue Most Wanted! If you aren't caught up on the series don't worry about it. I jumped in at book number 3, The Luck of the Bride and haven't felt like I missed too much. The characters always explain their histories with each other so if you don't need the context of their previous stories you'll be fine. This series is perfect for fans of Anna Bennett and Valerie Bowman. Read my review of The Luck of the Bride!